Keeping your camera gear safe and protected, yet accessible, particularly when out and about, invokes a question the answer to which involves the length of a piece of string. There is no "best" answer, as it is down to personal style, preferences, situation, climate, mode of transport, type and volume of equipment, and whether it is going to rain or not. Here's some ideas based on how I carry my gear. Between my wife and I we have three DSLRs, about nine lenses, three flashes, triggers, batteries, many memory cards, four tripods, a monopod, a variety of filters, macro tubes, cleaning kit, and range of other related knicknacks. Of course I don't carry the whole caboodle around with me wherever I go - I only take what I think I am likely to use. For the past eight years I've been using a LowePro Primus AW backpack. It has travelled extensively across three continents with me. This is a rugged, all weather, medium sized bag. I like that the main compartments open from the front. Most backpacks open from the top or back allowing villains to fiddle with your stuff. With the zips against my back my stuff is safe from prying hands. The pack has two main, equally sized compartments. The upper is less padded and I carry a rain jacket, sandwiches, hipflask, binoculars, cables, harddrives and pretty much anything else I might need. The lower compartment has padded dividers which can be configured for any camera/lens combinations. 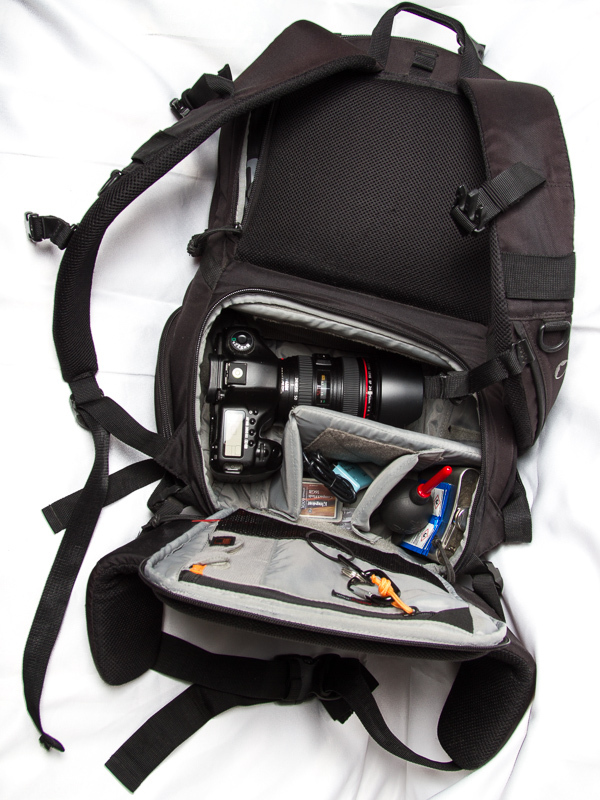 The lower compartment also has a zipped opening on the side of the bag, theoretically allowing one to extract a camera without removing the backpack. In practice this is not a comfortable operation. For the all-weatherness, the Primus has its own raincoat tucked away in a secret compartment. Many other camera bags have this feature too, and it's worth looking out for. Typically I would use this bag for outdoor or travel adventures because it holds a mix of camera gear and real-life stuff. Like my lunch. When I'm going on a specific photo job where I might need flashes and a range of lenses at my disposal, I'm likely to take my LowePro Nova 200 AW. This is rectangular, dedicated photographers shoulder bag with a bunch of padded inserts. It's not massive, but it holds the flashes, a couple of lenses and all the ancillaries securely. I wouldn't walk too far with this bag as, when loaded, it can be quite a strain on the shoulder. At home, it is the perfect container to keep some of the less-used gear stored neatly. That's enough about bags. The bottom line is that there is no one bag for every situation. Some women like to collect shoes. Photographers collect bags! For walking and shooting, you need your camera close to hand. Tourists and new camera owners think that it's cool and proper to use the strap that came in the box and advertises the brand in big letters. Please don't. There are a few reasons why not, the chief being that it is not comfortable or good for your neck. There is quite a lot of information here. The takeaways should be that you don't need to have a bag specifically designed for cameras. A "normal" bag will reduce noticability from the villains. Your bag needs will change over time and by situation so be prepared to have a different bag for every day of the week. Save your neck and don't use the strap that came with your camera. Rather get a slider strap like the BlackRapid. Think about separate storage for ALL your gear when you're at home, and don't forget about storage for the bits-n-bobs - batteries, cards, cloths, raingear, hipflask, etc - that you will need to carry around with you too.